Card Text After an enemy creature is destroyed fighting Overlord Greking, put that creature into play under your control. What happens if Overlord Greking destroys a creature with an ability such as “Destroyed: Return Bad Penny to your hand”? “Destroyed:” abilities trigger when the creature is destroyed, and Overlord Greking only triggers after a creature is destroyed. If an ability removes the opposing creature from play before Overlord Greking triggers its own ability, it no longer has the capability to put that creature into play under your control. 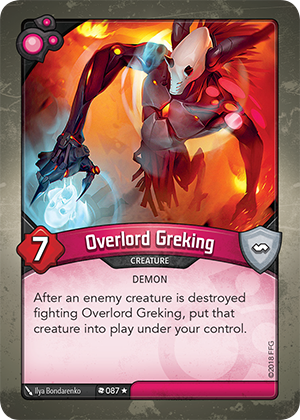 Does Overlord Greking need to survive the fight in order to resolve its ability? Does Overlord Greking’s ability work when it is attacked?